This site is dedicated to the game of hockey. It is a resource of hockey information for coach, player and enthusiast. To try version 011 of hockey playbook go to the download page. With free practice plan/play viewer for your iPhone/iPad (iOS) and android based phones/tablets. 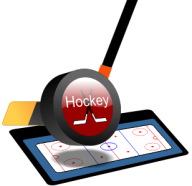 For a demo have a look at this how to YouTube video: Create an animated hockey play. Information about upgrading from version 008 - 010 to 011 can be found on the upgrade page. Don't forget to checkout the new screenshots and the feature matrix. Below is a short description of the available sections. The heart of this site, the growing collection of 311 animated plays and drills. To help with the navigation this section is split up in two, one for animated drills and the other for animated plays. You can also search through the plays and drills with the search box on the right. Animation will be a major help in understanding the flow of a play or drill. Each animation can be controlled with play, stop and pause buttons. Every week a different animated play or drill from the hockey playbook database. Animated plays and drills cannot be printed, so here are all the available plays and drills in a static form. The non-animated database now contains 315 plays and drills. The commercial part of this site where you can find hockey books, kindle e-books, Dvds, chalkboards and more. This part includes the monthly top 10 based on orders made on this site. If hockey isn't the only game you like visit www.jes-soft.com for Football, Soccer, Volleyball, Basketball, Baseball and more.